No need for iPhoneTM envy! Manage and listen to your voicemail through your mobile phone’s web browser. 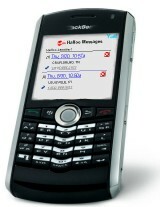 The special halloo.mobi mobile site gives you access to Halloo on the go! You will be able to see all of your messages visually, including caller ID, message length and record date. Scroll through your messages and listen to ones that are most important to you. Delete old messages with the same easy interface. Access and search your Halloo contacts database. You won’t have to worry about your contact list falling into the wrong hands if your phone is lost or stolen. And, managing your contacts on Halloo allows you to store hundreds, even thousands of names easiliy and conveniently. Change your Halloo follow-me number so that you don’t miss any important calls!